Investigating a damp patch in the attic. Started with taking up the floorboards in the top room to have a look. 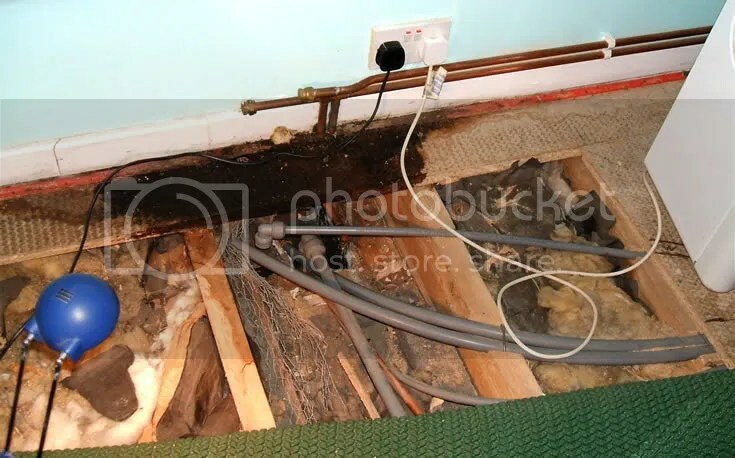 There is a dark patch around the point that the pipes come out of the floor to the radiator. That was my first suspect. However, confusion remains. There are four pipes that end there too. Just open pipes with an elbow bend that is not connected to anything. So, switch on the heating to see whether any water comes out. None. The boards behind are damp to the touch behind, right into the eaves. There is a roof window just above and my second suspicion lies there. I don’t have any expertise with roof windows but it doesn’t look as if the lead flashing is right. Rain water could, I suspect, run along its lower gutter and under a roof-tile each side. It should run onto a tile then downwards off the roof. This entry was posted in Home and tagged damp, DIy, Leak, Rain gutter, Roof, roof felt, Tile. Bookmark the permalink.